Herein we describe a simple method for the synthesis of Baylis-Hillman adducts and their acetates by utilizing inexpensively available cashew nut shell liquid (CNSL) natural resources. 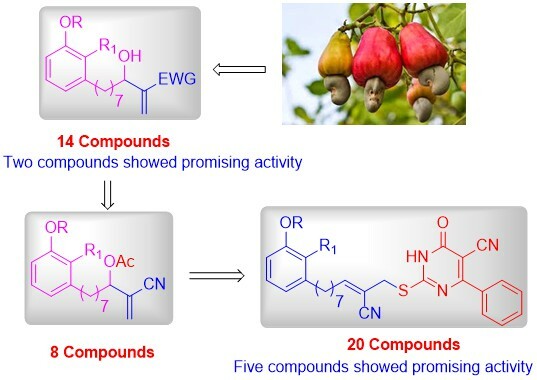 Furthermore, by using a molecular hybridization approach, a series of novel pyrimidine scaffolds (15a-15t) were synthesized via utilizing Baylis-Hillman acetates derived from cashew nut shell liquid (CNSL). All the newly synthesized compounds were screened for their in vitro antitumor activity. Baylis-Hillman compounds 5b and 5h showed promising anticancer activity against MCF-7. Among pyrimidine derivatives, compounds 15i, 15j and 15l showed promising activity against HEP-G2, whereas compounds 15j, 15k, 15l and 15m showed promising activity against MCF-7. In addition, compound 15m showed significant activity against K562 when compared with the standard. The structure-activity relationship (SAR) analysis suggests that the length of the carbon chain of phenyl ring played an important role in the potency of activity.